Largest van donation by a company to help address senior hunger and isolation in the U.S.
Caesars Foundation, a private foundation funded by a portion of operating income from resorts owned or operated by Caesars Entertainment, donated its 60th van to Meals on Wheels America. These donations represent more than $5 million in gifts from the Caesars Foundation toward ending hunger among older individuals in the U.S.
LAS VEGAS, July 11, 2017 /PRNewswire/ -- In an effort to help the more than 10 million seniors struggling with hunger and millions more living in isolation, the Caesars Foundation today donated its 60th delivery vehicle to Meals on Wheels America. These vehicles are essential to the Meals on Wheels network to deliver nutritious meals, and to make friendly visits and frequent safety checks to vulnerable seniors. For many seniors, Meals on Wheels enables them to "age in place" in their own homes, rather than be hospitalized or relocate to a long-term care facility. "Caesars Foundation is dedicated to improving the quality of life in the communities where it operates – it's part of our Code of Commitment and at the very core of who Caesars is as a corporate citizen," said Jan Jones Blackhurst, Chair of the Board, Caesars Foundation. "One way we accomplish that goal is through relationships with organizations like Meals on Wheels America, which does remarkable work helping vulnerable seniors cope with three of the biggest threats of aging: hunger, isolation and loss of independence." Since 2002, the Caesars Foundation has contributed a total of 60 vehicles to Meals on Wheels America members across the country, providing new and reliable vehicles for meal delivery to older individuals unable to leave their homes. These donations represent more than $5 million in gifts from the Caesars Foundation toward ending hunger among older individuals in the U.S.
"We could not address senior hunger and isolation on such a broad scale without sustained support from committed donors like Caesars Foundation," said Ellie Hollander, President and CEO of Meals on Wheels America. "From providing much-needed delivery vehicles, to building capacity at the national level, Caesars Foundation has played a key role in the success of the network for the past 15 years." According to the U.S. Census, adults ages 65 and older will outnumber children under the age of five by 2020. With this demographic shift, the demand for nutritious home-delivered meals will continue to increase and the need for fuel-efficient and versatile delivery vehicles will also rise. The high cost of vehicles often forces local Meals on Wheels America programs to use them well beyond a safe and reasonable life. 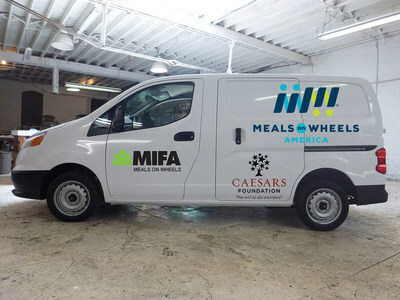 The vehicles donated by Caesars Foundation not only increases delivery reliability, they enable Meals on Wheels America to direct their limited resources toward serving more meals and building additional capacity. For more information about the Caesars Foundation, visit www.caesarsfoundation.com. Caesars Foundation is a private foundation funded by a portion of operating income from resorts owned or operated by Caesars Entertainment. The Foundation is the entity through which Caesars Entertainment funds programs and projects of $10,000 or more, as well as not-for-profit giving requirements imposed by certain operating jurisdictions. The Foundation's objective is to strengthen organizations and programs in the communities where our employees and their families live and work. For more information, please visit caesarsfoundation.com.